The promised two weeks have come to an end. On the Sunday morning we welcomed Murasaki-san in the living room. "Has the little sister been decided on?" Tomomi raised her voice, it was unusually bright tone. "Listen, there's something we have to say to Nii-chan. Ah! Stay like that as you listen. Somehow it feels like I'll get embarrassed if you look this way and my determination will go away." And so, starting with Tomomi the little sister candidates declared one after another. "I too have something to say to Onii-sama. I won't let only Tomomi-san to be the one to do it." "Can I do it too Nii-san? It's something that can be only said here and now." "Mii-chan too has something to say to Nii-chama and Nee-chama's." "...let's do it in sequential order, I'm first as the Monday's representative." Selene slowly took a breath a few times. I confirmed with her. "Is looking behind no good?" "...yes. I don't want you to look at the past but at the future." She continued with a clear voice. "...I only rely on Onii-chan whenever I'm by his side, as such I cannot become the little sister." Didn't she want to be my little sister? Why would she bring up such a thing all of a sudden. There's no problem with relying on me right? "What's this, then as not to repeat what Selene said. Umm... me too Nii-chan, I give up on being little sister. I thought of using Nii-chan to have people acknowledge me... to use Taishido name, I was wrong. Also, I'm in the same grade as Nii-chan is... I'm everyone's Onee-chan." She said it with a bright tone of voice, I didn't know what kind of expression Tomomi had. Murasaki-san's expression didn't change one bit. Sayuri lightly exhaled air and said. "M-me too, I decided so last night when we shared the bed with Onii-sama. This is the last time I'll call you like this... Onii-sama, you have taught me a different way of living. Rather to follow the fate that was given to me, I decided to select my own fate. I... refuse to become the little sister." And then suddenly, I felt her exhale beside my ear. As she suddenly approached, a chill ran down my spine. "Because a little sister can't become a lover." Whether its being permitted by law, ethical or common sense it's all out. Can it be that was the answer Sayuri put all her thinking in?! Seeing Sayuri whisper to me, Tomomi started protesting. "Ahh! What are you talking about in secret! Not fair!" "Fufufufu... it's nothing. There are no rules stating I can't whisper." Yuuki's yell interrupted Tomomi and Sayuri's quarrel. There's no way even Yuuki would tell she wants to quit being a little sister. "I have undertaken the challenge to become a girl. I haven't become more feminine yet. So from now I'll show you that I can polish myself and become a splendid girl. Without relying on Nii-san I'll do it myself. That's why, the boyish me isn't suitable to become a little sister." That's why Mika was the only one who wouldn't say such a thing. 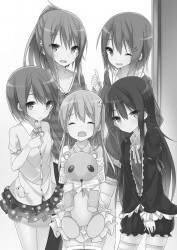 "If Mii-chan is the only one who is little sister, Nee-chama's will surely be lonely. That's why... if everyone is to disappear, Mii-chan doesn't want to be little sister!" Even though she was the one who is most lonely, she thought of what will follow after I make my choice... if I choose Mika, everyone will scatter. Murasaki-san muttered with an indifferent tone of voice. "U-umm... because I was carelessly acting as their brother, that's how it ended up." "I would like to confirm it once again... if the little sister isn't chosen Yoichi-san will lose the rights to the inheritance." "Anyone is fine so pick whoever you want... is what you're saying?" "Little sister candidates aren't allowed to decline. There is no right of veto. The one Yoichi-san choses will formally become his little sister." She said it with a cold expression. Even if the chosen one would loathe me, she would become my little sister if I decided so. What I have done in these two weeks. I dragged Selene outside. I helped Tomomi become more cooperative. I made Sayuri want to be more honest. I gave Yuuki some confidence. I didn't want Mika to be lonely. I wanted to help them even if just a little, the result was just this half-assed act of theirs. I looked behind. Everyone... was crying. Their tears made me feel like crying as well. But as their older brother I couldn't allow myself to cry. "Listen. I... all of you..."
I couldn't decide. I couldn't pick only one person. We're all family. A cold voice came from behind my trembling back. It was Murasaki-san. "It can't be helped. I'll ask again next week." With these words, all little sister candidates opened their eyes wide. "W-wait Murasaki-san! Today's the deadline..."
When I turned around again, Murasaki-san was turned with her back to us and walked towards the front door at a brisk pace. All strength left my body. "Hey Nii-chan? What do we do?" As I heard Tomomi's voice, I turned towards the little sister candidates again. "What do we do... t-there's one week to decide isn't there?" "Ehh! Like I said before I have no intention of becoming the little sister." Other little sister candidates nodded after she said that. Even though they could take huge heritage of Taishido household. Enough for them to happily play around for few lifetimes. Selene moved half a step in front. "...what do you want to do Onii-chan? 'It was a road you picked by yourself, you need to take a single step forward first!' is what you said to me, haven't you." She returned my words back to me unchanged. If it was told by someone who couldn't even choose a road to go down on, its persuasiveness would be completely gone. "If Nii-chan is lost then I have a piece of advice. I don't know if it will become your strength but 'The eldest son and eldest daughter being equal doesn't sound bad right?'. To share happiness with everyone, I'll take half of the trouble upon myself." "Or are you maybe uneasy about the fact someone didn't decide rails for you? 'In life, there are times during which you derail. However, from the point you derailed, why not find a new path for yourself?' is what you told me haven't you." Sayuri looked straight at me. Only one can be picked. That's the rule. "It might be difficult but 'you're doing your best to become what you want to be. I think that ambitious people are attractive' is what Nii-san said right? I'll cheer you on so face forward. I'm happy to have such a wonderful brother." I wonder if I'm a human who's worthy of Yuuki's cheers. "Even if there's no money, Mii-chan is 'proud to have such family'. If it's not alone, then Mii-chan wants to be little sister." I was completely cornered. By their words, and by my own weakness. Tomomi moved a step forward, drawing close to me. "What will you do, Nii-chan?" They're so lively and fun, I don't want to lose those irreplaceable little sisters of mine. "Do you really want us to be your little sisters? We want to become Nii-chan's strength you know? That's why we'll always say." Little sisters nodded to each other with a smile and said in a chorus. """""Shall I make you a big brother?"""""